Aaaaaaaaand we’re back! After going on a small vacation to Wildwood, we found it a bit difficult to fit in those daily sketches. As a result, we couldn’t upload last week’s roundup. But don’t worry, we’ve caught up and we’re back on track! We will feature Week 9’s Roundup today, followed by Week 10’s Roundup tomorrow. But for now, HERE WE GO. BRING ON THE SKETCHES! 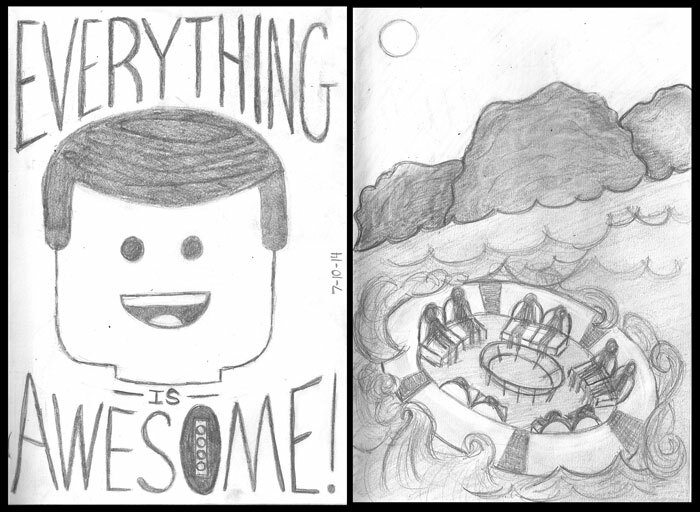 Day 57: Everything is Awesome! Everything is cool when you’re part of a team! While Sean is off building with Legos, Stef is riding the Congo Rapids at Six Flags. 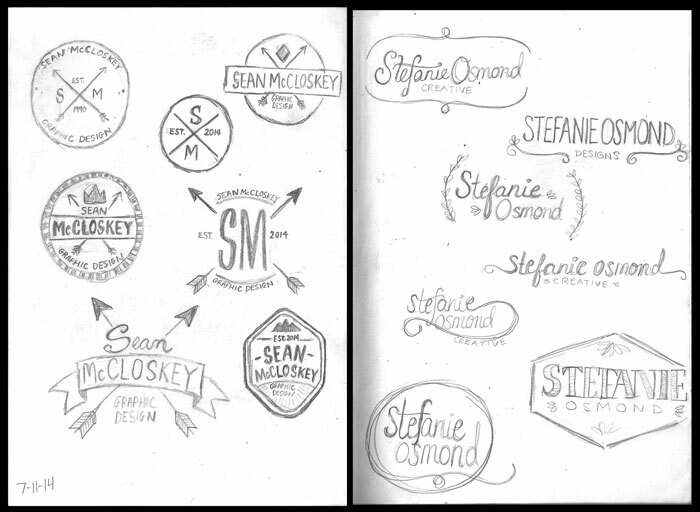 Day 58: Sean and Stef both take the opportunity to work on some personal brand logos today. 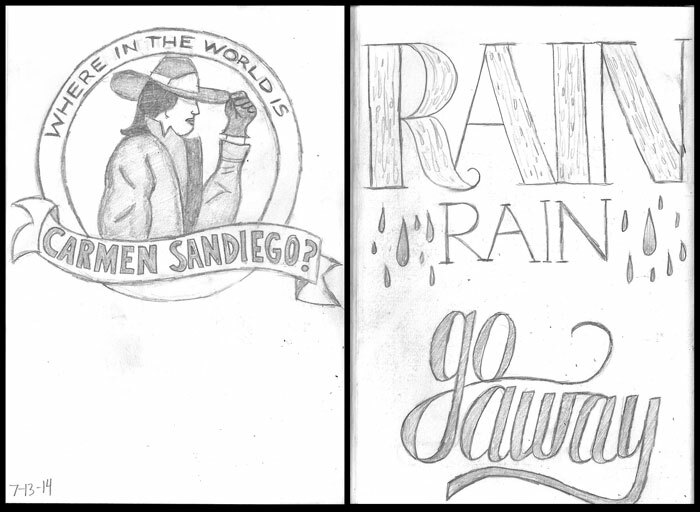 Sean has some outdoor/camping inspired designs, while Stef plays around with some hand lettered logos. Day 59: Ever play Psychonauts? You should! What’s better than a summer camp with psychic powers? Sean redesigns the logo for this fictional psychic playground. 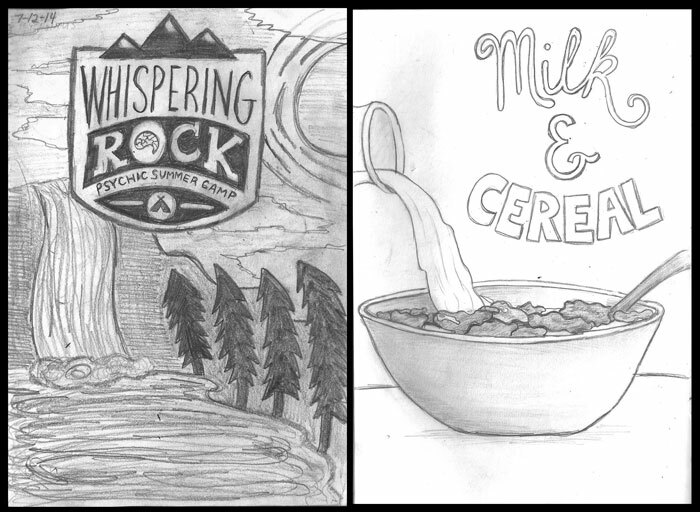 Stef is loving her breakfast foods today and draws some milk and cereal. Day 60: On this rainy day, Stef wishes things would clear up so she can go outside and enjoy her summer. Meanwhile Sean is hot on the case of the most elusive 90’s game show thief. 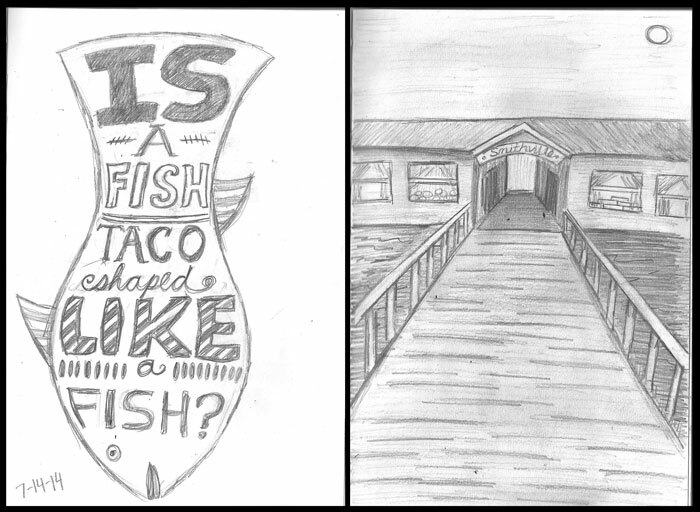 Day 61: We brought our sketchbooks to Wildwood with us, and had some fun times! We stopped in Smithville on the way there, so Stef took the opportunity to draw the scenery. After a delicious dinner in Cape May, Sean gets inspired by a quote from Rocket Power (to answer the question, they were not). Day 62: Day two of our trip down to Wildwood was just as fun as the first. 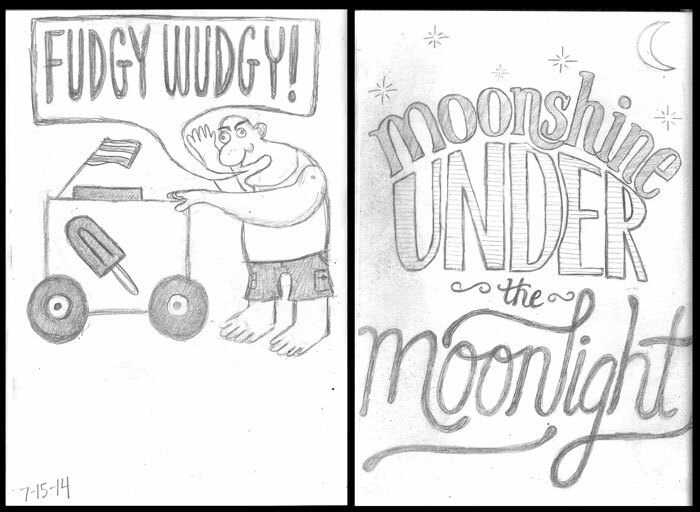 Anyone who has ever been to the beach will recognize Sean’s sketch of the Fudgy Wudgy Man, who pushes his cart of frozen novelties up and down the coastline. Our campfire was all about brats, s’mores, and apple pie moonshine. Stef was a fan of all three, but chose to draw some typography to go along with the tasty beverage. Day 63:***Theme: POLKA DOTS! *** Sean is always up for drawing monsters, so he had no problem making it a polka dotted one with nine eyes. 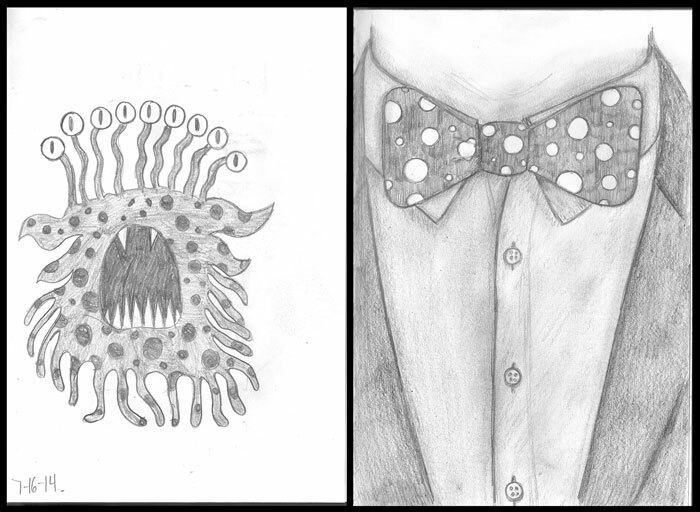 Stef is back with her amazing shading skills and sketches a polka dotted bow tie.